In addition to bouquets, the world of personal flowers includes boutonnieres, pocket squares, and assorted styles of corsages. This post addresses flowers traditionally thought to be for the guys but there’s no reason a gal couldn’t wear them. 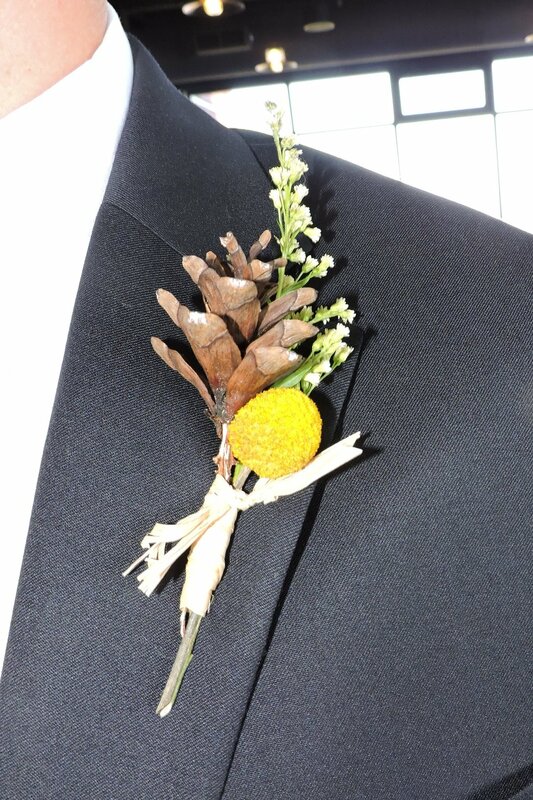 Boutonniere - the word is French for buttonhole flower. As far back as the 16th century, they were worn to ward off evil spirits and bad luck. It became fashionable to leave the top button open thus forming a lapel and then the flower was pinned to it. The possibilities for what comprises today’s boutonnieres are endless. I love being inspired by the buckets of wedding flowers waiting to be put into bouquets and centerpieces. From these, I create boutonnieres personalized for your wedding. A simple rose, add some greenery and perhaps a touch of gold penny cress and you have a timeless classic. Not your style? I can use seed pods and foliage to create a natural look. Are you into cooking? making beer? golfing? 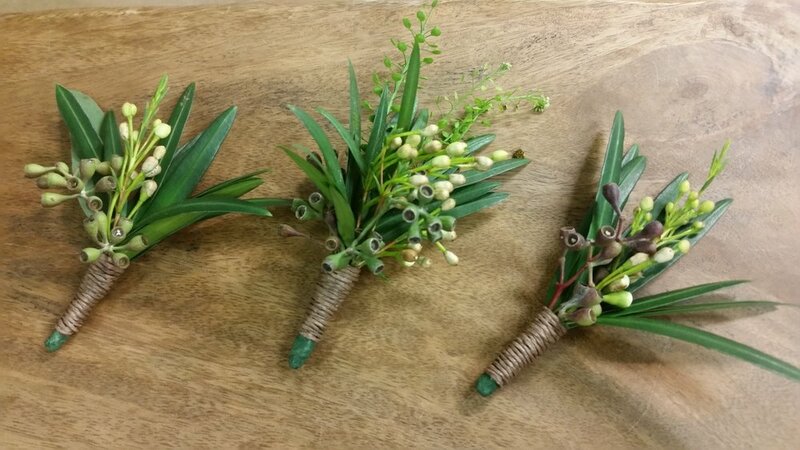 I can personalize your boutonnieres with sprigs of rosemary, hops and even golf tees. Another option, shown in the first photograph is a pocket square. It is made of foam core or heavy weight card stock and gets tucked into the jacket pocket. Flowers and other ‘bits’ are glued right to it using s special floral adhesive. Who wears a boutonniere? For your wedding, it’s customary for the groom, the groomsmen and dads to wear them. The granddads are always pleased to be remembered. If there are brothers not in the wedding party, it’s nice to think of them as well. The officiant is another person to consider. I particularly enjoy making tiny boutonnieres for ring bearers - even pinning them to the back of their jackets between the shoulder blades out of their reach if they are really young and likely to be held in someone’s arms. The ceremony is over and you are officially hitched! Congratulations! Let the Celebration begin! The first stop is the cocktail hour. One of the reasons many couples are having first looks or delaying the start of the cocktail hour is so they can join in with their friends and families. Decorations for the hi/lo tops can be as simple or elaborate as you like. It’s an area that can be a bit playful and more relaxed. For the athletic couple, dig out some of those old softball/baseball cards, put them on a stick and tuck them in a bud vase with some greenery, in a small design or even in an apple or artichoke. Are you into craft beers? Collect bottles and add a few stems - hops bloom in late summer and would be a fun touch. Consider these options – glass vase with a single large flower and perhaps a rustic or gold wire accent, trio of glass vases with flowers, wrought iron urn with roses or greenery, flower floating in glass, small, short clutch of flowers leaning in cube, small lanterns and objects special to the couple such as a stack of books. Use your cocktail hour to show your personality and give your guests a hint of what’s to come. Petite clutch of flowers in embellished glass adorns cocktail table at the Omni Parker House. Together these create a centerpiece; separately, they can be used on cocktail tables perhaps with a few scattered flowers. 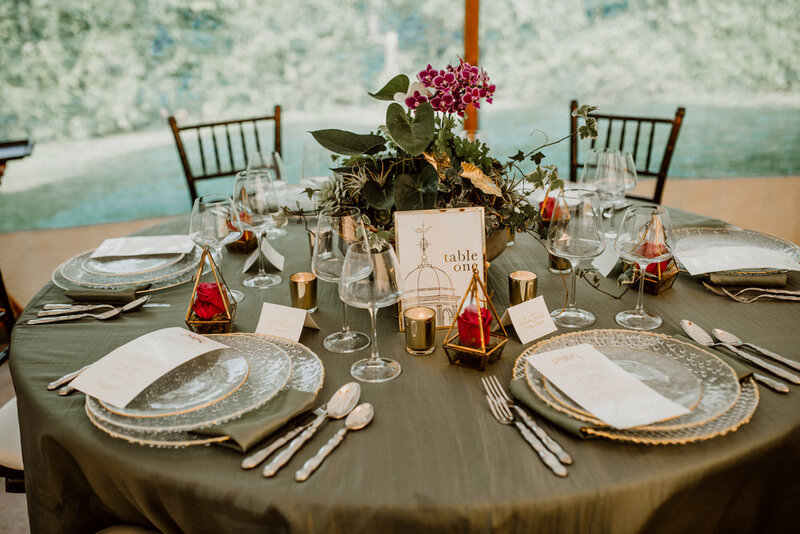 Back to the Big Fake Wedding New England 2018 - As the bride didn’t want any typical centerpieces, I designed a centerpiece for a round table in a concrete container that I dry brushed with gold paint. Grapevine balls, moss, polished stones, succulents and painted gold leaves were tucked around flowering and foliage plants, such as orchids and anthuriums, that are typically found in a conservatory. Taking the table to an upscale (as opposed to a rustic) direction, I selected textured, clear glass plates rimmed with gold. A rose, resting on moss that lined a gold edged glass pyramid, brought color to each place setting. The perfect green linens provided by @xothegirls and unique printed designs of table number and menus from Jen Pepper @thechattypress finished the look. My second table was a beautiful long farm table which begged for an elevated ‘jungle’ of orchids and greens. Phalenopsis and dendrobium orchids were tucked into a garland of greenery which extended down on to the table. Hops grown in my yard hung playfully. The table number was suspended from this in a floating gold edged frame. Additional plants and flowers in small glass vases were on the table. Floral Sydenstricker plates were put on ivory china with a textured rim in a trellis pattern. At each setting, there were song lyrics or a title along with the author in floating glass frames and echeveria in a glass teardrop. Once again, thanks to Jen Pepper @thechattypress and @xothegirls for printed materials and linens. The Big Fake Wedding was a great experience. All the vendors developed quite a camaraderie working in the crazy heat and then ridiculous downpour to pull this together. I would recommend any of them. The Big Fake Wedding is a bridal show alternative featuring a couple who renew their vows in front of guests (engaged couples) followed by food and dancing. The BFW staff developed a mood board for the vendors to follow. New England’s theme was a garden house/conservatory vibe using shades of green, clay, and orchid. For the floral portion, four designers each got 2 tables and an extra area to focus on. I selected bouquets and boutonnieres. My bouquets were not typical of those seen on social media and were well received by brides visiting my vendor table after the ceremony. The bridal bouquet featured a mix of interesting textures with an airiness and movement. Anthurium and orchids were some of the flowers added for the greenhouse touch. Want something interesting? Here’s a new take on bridal bouquet shapes. Bridesmaid’s bouquet #1 was designed in a custom crafted wire structure. Wool and jasmine vine were captured by wire tendrils and butterfly ranunculus floated above. Bridesmaid’s bouquet #2 was a clean, contemporary interpretation of a conservatory. Tropical flowers and foliage are grouped for emphasis. The guys also wore a touch of the greenhouse vibe. The groom sported a white anthurium with kalanchoe and greenery. The groomsmen wore either an orchid with kalanchoe and greenery or a spray rose with tillandsia and seeded eucalyptus. A floral pocket square was also an option but the guys opted to wear vests and not jackets. A modern take on corsages were worn by the gals during the reception with flowers magically worn on their wrists. It was a fun way for the gals to have flowers without carrying their bouquets. Stay tuned for Part 2 where I’ll share photos of the table designs. Ceremonies take place in many different locations and flowers can enhance them all! Flowers can be on the altar for a church wedding. (I will be sure to check with the church for their rules and guidelines). Aisle markers can be placed on every few rows. A welcoming design can be placed at the entrance and even handrails can be adorned with flowers. All these flowers can usually be re-purposed at the reception. Less traditional venues can use flowers to define the ceremony space. Arbors can be decorated with fabric, greens and/or flowers. If your venue has a gorgeous view such as a city skyline or the rolling vista at The Crane Estate, I have towers available that don't interfere. These can be moved to grace the entrance to the reception. 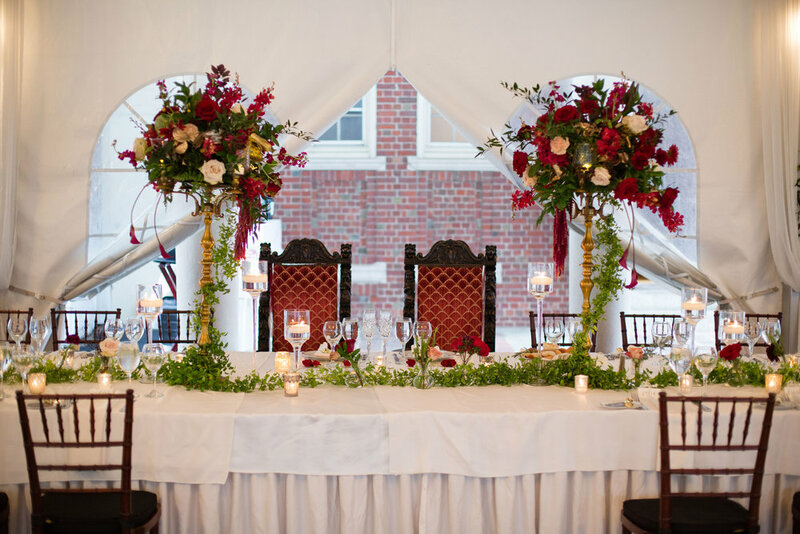 A pair of designs on pedestals or lanterns with flowers can mark the start of the aisle. Lanterns can also be placed along the walk - either hanging or on the ground. Each location will have its own personality that I will explore (either on site or through photographs) to make your ceremony space extra special. You have your venue and selected your dress. The mood for your wedding is moving from concept to reality! Your wedding bouquet will be the jewelry on your vision. It continues to set the tone of the day. The photos of you with your bouquet will become one of your iconic keepsakes. So what kind of bouquet do you want? Should you get? Your bouquet should be in proportion to you and the style of your dress. Popular right now are the bouquets with lots of greenery and lush flowers. These can get big so make sure you hold it low so you aren’t lost behind it! Softer versions of cascade bouquets are appearing. Round, hand-tied bouquets are still on the scene. I like to make these with the flowers at various heights and lots of texture to add interest. Simple wreaths with flowers are another trending style. Floral purses (purely decorative) and wrist bouquets (they are attached to your wrist and can be quite dramatic for that special first dance!) are a different take on the traditional flowers. As a floral designer, I can make you something unique that you won’t see everywhere else. Trending are bold colors mixed with paler tones. Unlike a few years back where a bouquet of red roses could look like a bull’s eye against a white dress, the combinations are elegant and have an organic feel. They look fresh from nature despite needing a level of skill to achieve this un-fussy look! Assorted greenery with flowers in a range of whites is a classic look that is clean and refreshing. This color combination can be made in any of the styles previously mentioned. You may have heard the Pantone color of the year is Ultraviolet. While we may see some of that this year, it will likely take a couple of years to show up in the bridal world. (Think Devil Wears Prada and how Andi’s sweater was that special blue from a collection a few years earlier that finally trickled down to daywear). Marsala was the color in 2015 and we are seeing more of that this year mixed with blush and apricot. What about your ladies? There are the same bouquet options, they are just made smaller than your flowers. It’s perfectly fine and common for these to be a different style than what you carry. If you have a large group (I’ve done up to 10 bridesmaids bouquets for one wedding! ), smaller bouquets can be created to accommodate your budget. The finishing touch for the bouquets is the treatment of the handle. Stems exposed, completely wrapped or partially wrapped are all options. Streamers are another trend. I have a collection of hand-dyed chiffons and silks that I augment my double faced satin ribbon collection with for an ethereal effect. Be careful of one or two long streamer hanging down the front of your gorgeous dress. A bunch of streamers at assorted lengths will look better in the photographs. If you have questions or would like to know more, please use the Contact Us page or the button on the Wedding Page. I hope to hear from you! Lush greens and muted colors are the perfect flowers for a wedding in the courtyard at Willowdale Estates. There are many facets to wedding flowers. In a series of posts, I will discuss them. Today’s post focuses on my booking process. The when and the where will be first on your mind. Then come all the vendors that will bring those spaces to life and record the event. Flowers are such an important part of this. They help set the mood, add warmth and will be in so many photos. The bridal bouquet will be photographed the most. Your guests will be looking at your centerpieces for 4 hours! So where do you start? When I initially talk flowers with a bride/couple, I ask for key words to describe her/their vision. Natural Elegance, Country Club Chic, City Sophistication, Rustic Casual, Traditional Formal, Modern, Contemporary, Beachside, On the Lake, Romantic, and Ethereal – these are all starting points. Without even realizing it, you’ve considered this when you chose your venue. The right flowers and containers will bring your concept to life. I’ll write more about specific flowers and styles in a future post. Like venues, floral designers get booked up as well. There is only so much space, so many assistants and most importantly – so much time in each shop. As a specialty studio, I generally take only one event a day and sometimes, depending on the size, only one event per weekend. I deliver the wedding (with assistants if needed) so that I can make sure the flowers are as perfect as when they left the studio. As a National Garden Club flower show judge, I’m very particular how everything looks. SO – when do you select your floral designer? If you like my work, I recommend you call as soon as you know your date. When we talk, I get a sense of the scope of your wedding and go over details. This is so when we meet, the time is spent on ‘show and tell’ of the items I’ve pulled from inventory based on our conversation. I’m aware of how precious and limited time is for couples so I meet anytime, day or evening, 7 days/week. Ideally, we would meet after you have selected your dress/suit and preferably after you know what style/color your attendants will be wearing. I’ve had brides set on one idea and then go a totally different direction after shopping for dresses! What if it will be awhile before you go shopping? I appreciate that it is a bit of a quandary if you think you want to me to create your wedding flowers but we haven’t had a consult in person yet. I hope our conversation, images on social media and glowing reviews would put your mind at ease and you feel comfortable booking me prior to meeting in person. A retainer reserves the day in my book and is applied to your total. I truly love to educate and help couples through the flower portion of their planning. I’m frequently told it is the most enjoyable and relaxing part of their planning! Dahlias, calla lilies and anemones are among the flowers bringing elegance to this upscale farm table. The week concluded with a two day large scale installation where we transformed the barn. Inspired by the barn’s ceiling’s architecture, Gregor drew a pyramidal form to be created out of iron and become the basis of three floral chandeliers. These were welded by Holly’s husband, Evan, who later suspended them from the barn’s rafters. Initially hung at eye level, we attached branches, oasis and plant materials. There were two large statement pieces placed on pedestals, Gregor created one and Jenny Murphy and I did our best to keep up with him to make a mirrored piece. Each one of us also created a centerpiece. These were put end to end to make a long floral runner. The table was set and candles lit. The affect was enchanting. Lots of photographs were taken and then retaken more than once as the changing light made the room even more magical as the evening progressed. Holly arranged for wine and food as we enjoyed the splendor of the barn and each other’s company. At the end of the night, there were just 6 of us sitting at the glorious table with the blush candles melting into the silk runner. Holly retrieved some cordial glasses (previously used only as a prop) for us to drink a something akin to Bailey’s Irish Cream. It was a fabulous end to a fabulous week. Twice in 6 months! I got to learn from Gregor Lersch twice in 6 Months! This time he came to America to the beautiful Hope Farm in Waterford, Virginia to lead us in a workshop hosted by the most generous Holly Heider Chapple. Ahead of the participants’ arrival, Gregor had created a multitude of structures. He led us through each piece noting technique, potential uses, and flower selection and placement. Each day started by 9 and went well past the scheduled ending time of 5 pm because he had so much to share with us. We created structures, centerpieces, and wearable flowers. 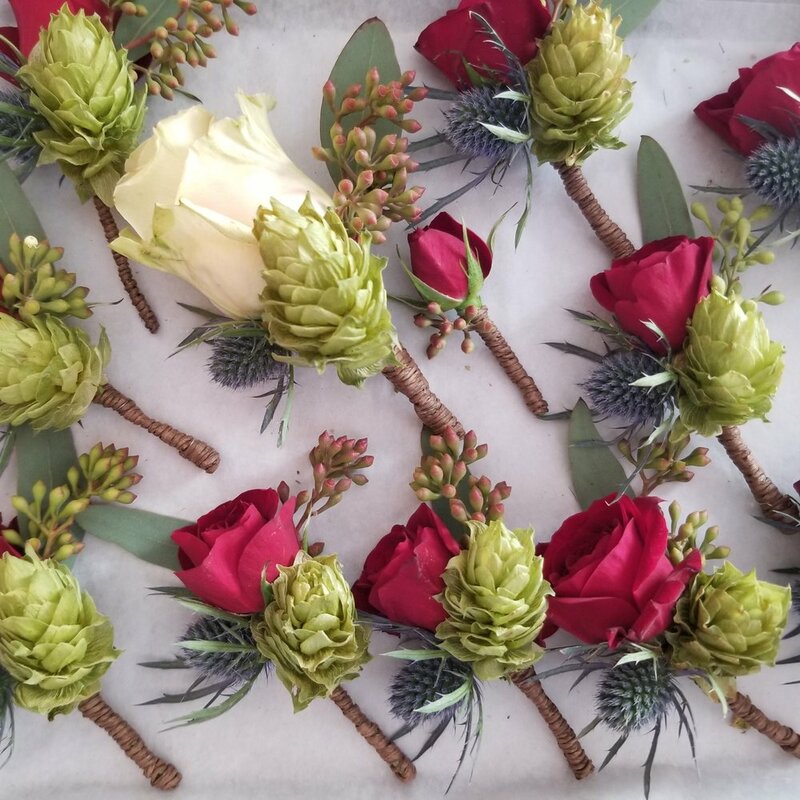 We explored bouquets with structures, totally wired bouquets, and hand-tied cascade bouquets created by relying only on the selection of plant material without any mechanic. We’d receive thoughtful critique in a group so we could learn from each other. Everyone was so open and sharing with their knowledge. I enjoyed meeting everyone and look forward to our paths crossing again. Holly had the most extraordinary flowers for us to work with including phenomenal Café au Lait dahlias from her garden. We had to plead with her to share some of her knowledge as she was hesitant to lecture and wanted us to maximize our experience with Gregor. This event qualified participants with the proper criteria to become a Chapel Designer – a collective of floral and event designers. I’m please to say I am part of this very passionate and supportive group. Symposium- July 2017 - A time to reconnect with flower friends and make new ones, a time to learn new techniques, a time to work behind the scenes, a time to see innovative programs, a time to congratulate the new inductees to AIFD, a time to encourage those who tested to qualify for AIFD, a time to meet the many vendors that support the floral designers, a time to visit the sites of Seattle and be awestruck by the artistry of Dale Chiluly. I'm excited for next year - Discover 2018 in Washington, DC! Dendrobium orchids and freesia blooms individually wired by Ralph Giordano CFD and me for bouquet created by Brook Raulerson AIFD for her presentation. At the Garden Club Federation of MA Annual Meeting, I was one of three designers asked to interpret a sculpture created by Rob Lorenson as part of the Natalie Wolf Forum. I choose to replicate some of the shapes and enhance them with an assortment of flowers in complementary colors. The shapes were then organized so the flowers within also created rhythms. Sculpture created by Rob Lorenson similar to one we interpreted. He created a new piece for the program so we saw an unpainted 'work in progress' photo and thus I don't have an image of the final piece. To create my piece, I cut wreath forms made of MDF into pairs of arcs and painted them red. I cut oasis wet foam into shapes to fit between the two pieces. The sides of the foam were covered with pan glue and attached to the MDF pieces. The glue waterproofed the oasis while adhering it to the MDF boards. Once in place, the foam was saturated using a forceful stream from a water bottle. Ribbon was wrapped around some of the pieces to add contrast. Euphorbia is placed to take advantage of transparency within it. My floral escapades continued in March with a trip to Germany to attend the International Bridal Seminar given by Gregor Lersch. It was important to him that we not only improve our floral skills but that we connect with each other and learn about all the cultures that were represented. I met designers from Poland, Italy, Turkey, England, Romania, Holland, Germany, Ukraine, Hong Kong, Pakistan, Israel, Austria, Belgium and I'm sure I missed a couple! The first evening, we were treated to a floral demonstration and then a lovely reception where the focus was to meet each other before the three days of intensive work. Lunch and refreshments for morning and afternoon breaks were provided and gave the participants more opportunities to bond with each other. The first day started with demonstrations. On days 2 and 3, we started with critiques of the previous day's work and then had demonstrations. Afterward we proceeded to the workroom were there were all the supplies and gorgeous flowers needed for us to execute our interpretation of the day's topic. It was heaven!!! Gregor was very in tune with where we were from and how that influenced our designs when he critiqued them. An unusual color combination may have traditional roots in a culture and he would seek out this information before commenting. He would go around the room and offer suggestions. Gregor readily approached the designers and would initiate the conversation. I can't over emphasize how thoughtful and hospitable he was, how thoughtful his comments were and what a terrific team he had to support him. I can't wait to return to Bad Neuenahr to attend another workshop! There were so many fabulous settings on this site to photograph one's work. Just a gorgeous location with views of vineyards on the hills. Kyogi paper was layered on a cardboard base as well as glued on to bind wire to form the base for this completely wired and taped bouquet. Keeping it cool in the evening and covered in plastic which had been sprayed with water kept it looking fresh for 3 days! A few bits of kyogi paper coming out of the floral portion connected the flowers with the base much as you would connect a floral design to the container. I was invited to work as part of the AIFD team, under the leadership of Cres Motzi AIFD, creating an exhibit at the PFS. The show theme was Holland. My subgroup focused on artwork. I was asked to create a Piet Mondrian inspired piece using dried pods. The frame was designed by Ron Mulray AIFD and created for the show. My role was to fill the sections with the primary colors typical of Mondrian's later work. Pods were dipped in diluted interior house paint and shaken hard/spun to remove excess before being placed in holes cut in flower boxes to dry. Pieces of styrofoam joined to create the base were covered in paper before the pods were stuck into it. Suzanne Sampson AIFD and Lyn from Minnesota were invaluable in helping me get the piece completed before the rigging crew came to hang it. Theresa Clower AIFD created a Van Gogh inspired piece using wheat and Jane Godshalk created a floral piece reminiscent of Flemish design. The dried pieces were created twice so they were visible when viewed from both sides. Other areas of Holland featured in the AIFD exhibit were Gin, Canals, People, Delftware, and Bicycles. Three pieces of 'art' were inspired by Dutch painters. Close-up of work in progress of the Piet Mondrian and Van Gogh inspired pieces. I was full of good intentions when I started this blog. I didn't think it would be time to register for AIFD 2017 Symposium before I wrote again! To catch up a bit - Induction was incredible. The whole experience was fabulous. The other members were so welcoming, everyone was so congratulatory. I took workshops with Leopoldo Gomez, Wendy Andrade and Beth O'Reilly. The stage presentations were so enlightening. The gala evenings had gorgeous decor. The vendor reception offered a chance to meet some of the folks on the other end of the phone and learn about new products. Gorgeous flowers and designs with interesting techniques and stories were everywhere. Feel free to reach out to me via the 'Contact Us' page if you would like information about the American Institute of Floral Designers. Induction night with Leanne Kessler and Joyce Mason-Monheim - these are two of the loveliest and most helpful ladies with a true passion for the flower industry and those in it. Please click to see more images. I've always liked flowers and gardens. I remember my grandmother's garden in South Ozone Park on Long Island. My grandparents were lucky enough to have the end unit of the brownstone which meant they got the rectangular space next to the garage out back. The entrance was a climbing rose you had to sneak by so it didn't 'get' you. Other images are hazy but I always thought that place magical. Fast forward to the turn of the century - (Jeez that sounds old!) My friend invited me to see her garden club's flower show. It was the horticulture that drew me in - "I can grow hydrangeas like this," I thought - my competitive nature sneaking in. I joined the club when my youngest started school. I found myself entering flower shows and then going to National Garden Club (NGC) Flower Show school so I could figure out what the heck the judges were talking about. "What do you mean those three callas which so perfectly represent the sails of the ship aren't connected to the rest of the design?" Now an Accredited NGC Judge, Master Level, I know what they were saying!